The Heron HD3100 linear imager brings unmatched elegance along with latest advanced technology to the modern point-of-sale. The stylish silhouette of the Heron imager enriched with multiple color changing lights, innovative and modern design material, color and artwork together with the audio speaker, extends the customer’s brand experience to the ultimate interaction at the point-of-sale. Innovative and Unique Design: Raises the bar for cutting-edge POS checkout experience. The elegant silhouette of the Heron imager extends your brand experience to the final interaction at the point of sale with your customers, reflecting the same artful considerations you put into your merchandising. Datalogic Patented: Patented with ‘Green Spot” technology for aiming and good-read feedback. 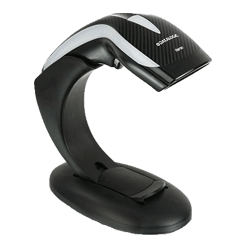 This scanner is very easy to use, and also has the latest advanced technology. Another benefit is the Heron HD3100 imager differs from the usual color scheme of handheld devices by providing a stunning 'black' or 'white' color option, emphasizing the curving lines of the new enclosure.